Hit dice in the original little brown books only used six sided dice. Plusses were applied to modulate the values by class. So (ignoring constitution for simplicity), a fourth level fighter would have 4d6 HP, whereas a fourth level magic-user would have 2d6+1 HP. Coming to OD&D from one of the later editions, the absence of different hit dice is one of the most striking differences (along with flat d6 weapon damage, to which the size of hit dice is related). This approach was dropped almost immediately, in Supplement I: Greyhawk, and forever after different classes have used different sized dice for their hit points. It’s relatively easy to fix, though. Here is my proposal, broken down into progressions for high (fighter), medium (cleric), and low (magic-user) hit dice. The patterns should be easily intelligible. The expected values are relatively close to the originals, though in Men & Magic the magic-user gets all the way up to 9+2 (by 16th level). Gary sure did love the wizards. What about after tenth level? My inclination would be to halt HD growth entirely past tenth level. A sort of soft E10. It would also be reasonable to keep adding some bonus HP though, in the manner of AD&D. I would probably just make it a flat +1 per level for every level above ten, irrespective of class. Going much above +1 would start to overwhelm the d6 values, unlike the larger hit dice sized used by AD&D, so probably best not to adopt the AD&D numbers (given characters of equal level, the relationship of fighter > cleric > magic-user will still obtain, which I think is the most important thing). 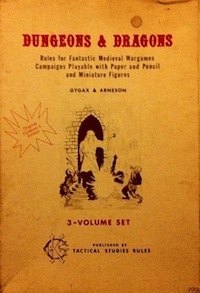 This entry was posted in Rules and tagged OD&D on March 19, 2013 by Necropraxis. If I played OD&D, I would definitely adopt your version of class hit dice. Since a hit die averages 3 hit points, why not just give out one hit die per three levels? 10, 10+1, 10+2, 11, etc. I like the variable hit die method of OD&D since it provides a single number that reflects a characters combat ability. You can use the number of hit die to determine attack bonuses or damage (rolling extra damage every four hit dice for example), and it will scale for the various classes. It also lets magic users start with a reasonable amount of hit points. I’ve started using the OD&D hit die progression in my B/X game by making the hit die size scale with the creature size. So humans get d8 hit dice, hobbits get d6, etc. This matches the racial classes of B/X. This allows you to give large monsters more hit points without making them much better at hitting. The big and slow monster archetype that’s pretty much impossible to create with standard D&D. I also use the hit die size as the base damage for characters which ends up matching the damage that monsters do pretty much up to Ogres. As Kobolds have d4 hit points and do d4 damage, goblins have d6 (or d8-1 same average) and do d6 damage,etc. One hit die per three levels would approximate +1 per level (slightly more, as the expected value of 1d6 is 3.5, but that’s not all that important). So that seems reasonable, though given the amount of XP required per level above 10, it might be better to have some benefit accrue every level (because not much else is gained when levelling). I think the more important decision is whether or not you want hit points to be potentially unbounded.